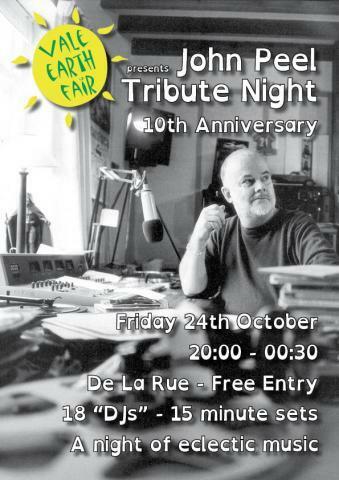 The dust has settled at the Vale Castle now and its time to come out and play again starting with the annual John Peel Tribute night which takes place on Friday 24th October at the Thomas De La Rue. It's been 10 years since we lost one of Britain's finest radio DJs and a new generation is here that barely know who he is. We won't stand for this so need to educate them about what a diverse music collection really is! The fun starts at 8pm and runs until 12:30. Free entry, though donations as always are gratefully received.